Question: Are we a nation of dog lovers? If so, then who could enjoy this? Who would put their dogs through this? ​Who would condone betting on dogs, knowing they suffer like this? Injuries sustained at the tracks are not uncommon. Many injuries are sustained by dogs bumping into one another, especially on the first bend, being knocked down or hitting the rails. When a dog sustains a small injury that may effect its future performance in racing, it often result in the dog being destroyed. Broken toes and hocks are more common injuries and may render a dog as lame therefore no longer of use and either destroyed by the track vet or killed “Economically”, Pistol euthanasia is the alternative phrase (a name commonly used by those who cater for the industry to conceal the reality) for a bolt gun to the back of the skull. Vet Graham Oliver gave an independent and professional view on track injuries. Stress fractures and repetitive injuries are expected injuries in human athletes and greyhounds. Greyhounds sustain more injuries than humans, there is one causal factor. The racing industry talks about track surface, trap placement, which are factors. The general public think collisions cause the injuries, collisions play a part. The first bend is notorious for injuries, as the greyhounds group up and jostle, again a factor. 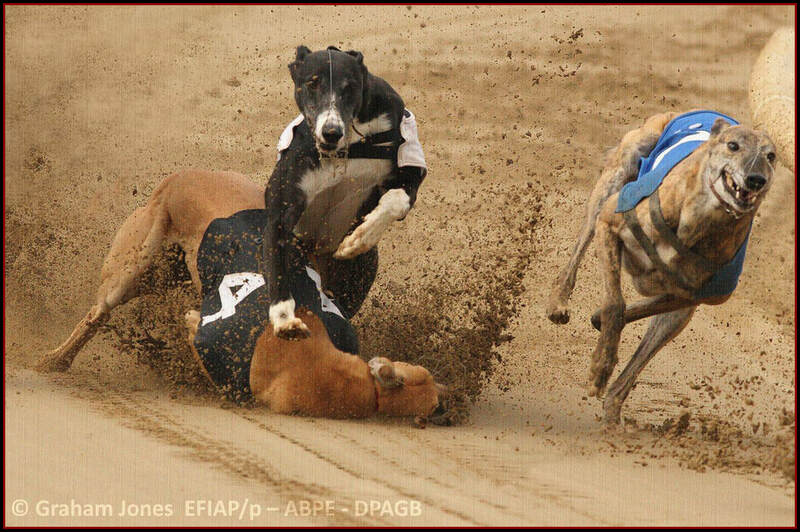 The main cause of serious injuries in racing greyhounds, which can result in euthanisia, is the simple act of running on the bends. Forces exerted on legs while running When standing the forces exerted on the legs is the body weight, spread through all weight bearing bones in the body. When running, muscles push against the ground to create speed, higher speeds are achieved by applying more force to the ground, and this force equates to 2.0 to 2.9 times the body weight; the force impacts predominantly on the feet and lower legs. Running on bends, is the added centripetal force, more force is required from the runner to maintain the same speed. In humans the speed on bends is limited by the inability of the musculoskeletal system to generate the required forces or withstand the extra force. Humans counter the increased force by increasing the contact time of each foot with the ground, resulting in a reduced speed, so the impact of the forces is spread over a longer time and remain constant running on a straight or a bend. The difference in greyhounds running on bends This is the important bit. Unlike humans, greyhounds can produce the extra force to counter the centripetal acceleration, with no reduction of speed and importantly no change in foot contact time with the ground when they run on bends. This results in an increase effective weight by 71% and an increased peak force of 64.5% in each leg when running on bends. It is thought greyhounds can do this because the front legs are responsible for weight bearing and direction, while the hips, back legs and spinal extension produce the power and speed. Below I demonstrate the difference in forces experienced by a human and greyhound. I contacted a Senior Research Fellow and Reader at the Structure & Motion Laboratory, RVCL, author of papers showing increased forces on bends in greyhounds, to confirm my calculations. 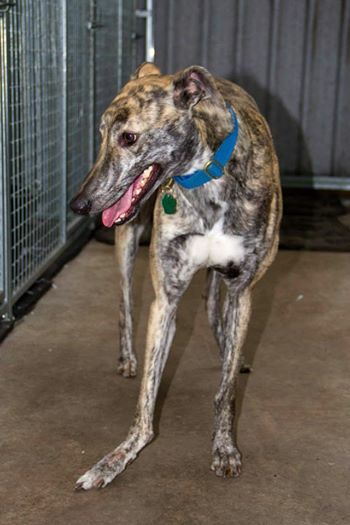 They suggested a force of 2.5 bodyweight for greyhounds on the straight, I took the highest factor of 2.9, for human on the straight, and used 30kg weight for both human and greyhound (average greyhound weight). The second important factor, as greyhounds always run counter-clockwise, greyhounds transfer weight to bones on the left side (inner track side) of all their legs, this cause asymmetrical loading on the musculoskeletal structures. The bones that are nearest to the inside of the track 3 experience higher compressions stresses while the outside bones are put under higher tensile forces. How running on the bends leads to injuries commonly seen in greyhounds 74% of injuries in greyhounds occur on the bend, usually the first bend. Stress fractures and soft tissue injuries are common in athletes, especially runners, because of the cyclic loading (easily read up on sporting pages). Stress fractures (and most tendon injuries) are not the result of a high excessive force, seen in direct trauma (collision), but the result of healthy bone (tendons) breaking down due do repetitive forces and then fracturing when exposed to an otherwise manageable force. In this section I explain how bends cause a higher rate of these injuries and the areas these injuries occur in. * Higher forces over a short time (sprinters), in greyhounds this mainly occurs from the load increase on the bends, will be happening on the straights to a lesser degree. * At the first bend greyhounds have reached their top speed and are coming together, even without any contact, greyhounds have to change direction or brake causing a sudden slight increase in the load. * Collision or minor contact with another greyhound also produces a sudden increase in load. Where the injuries occur is decided by where the repetitive strain or the impact load occurs (tennis elbow), in running the lower legs. 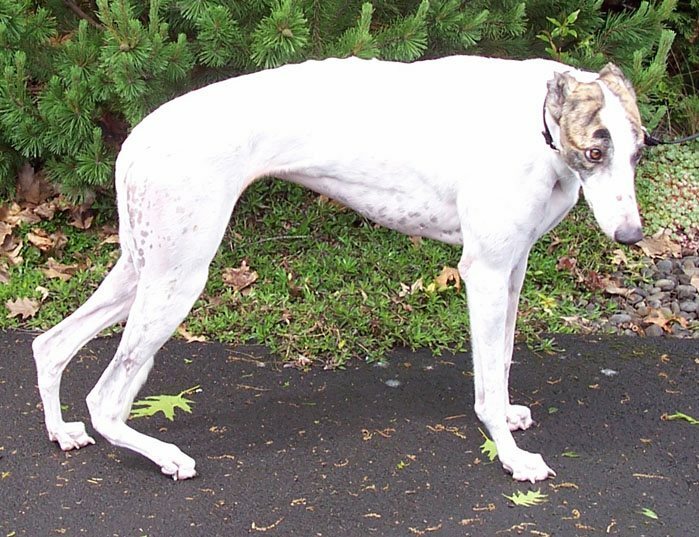 Greyhounds sustain injuries to bones and tendons rarely seen in other breeds, because the distal limb bones experience asymmetrical loading on the bends. * The tarsus (commonly known as the hock): predominantly on the right side, fractures of the central tarsal bone (CTB) and accessory tarsal bones. All the literature I read state these as common sites due to asymmetrical loading and the fractures due to stress fractures. Direct traumas, resulting from falls or collisions, are rare, 2% causing long bones fractures. Guillard reported an incidence of 24 per 1000 greyhound runs, but as he states many of these were minor, I tried to find my own data. An abstract showed a study of high school athletes in the United States, there were 51,773 injuries in 25,268,873 athlete-exposure, resulting in an incidence of 2 per 1,000 athlete-exposure. Data recorded 4,656 incidents in 2013 over all races (except trials) on the GBGB tracks], where greyhounds did not finish or finished at a distance, which I took to be injuries. In 2012 there was 4980 racing fixtures, gives an estimate 358,560 greyhound exposure, I doubt racing fixtures for 2013 differ significantly. 4,656 injuries during 358,560 greyhound runs equates to 13 injuries per 1,000 runs. There are sources for error to enter into my calculations, but on balance, I think it under represents the true figure of injuries in greyhounds for several reasons. 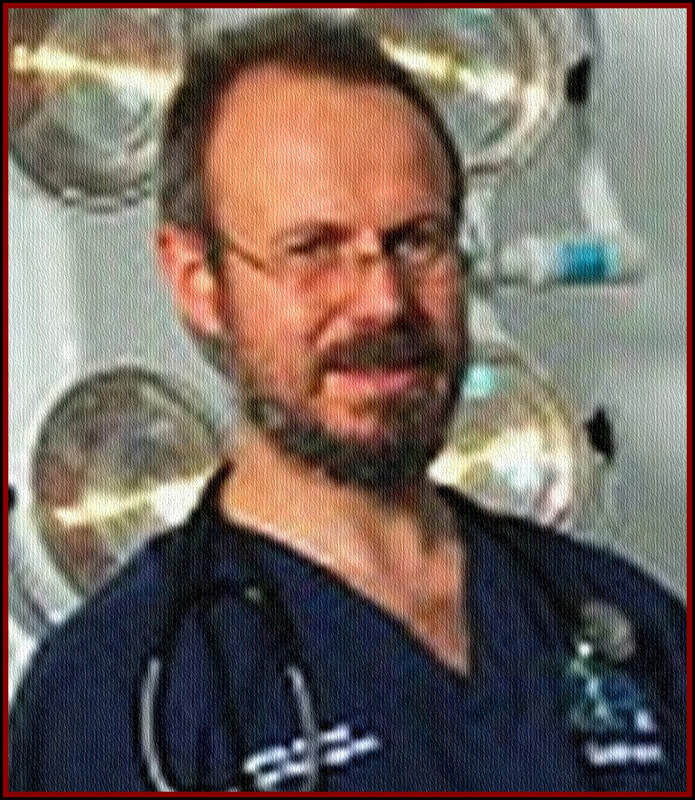 Hercock’s thesis reported 87 dogs euthanised at one GBGB track over a 38 months. 78 of these involved injuries or health problems relating to racing; 42 hock and 21 front legs If these figures are representative for all tracks (The Donahue report suggested 30 euthanasias per track per year), this approximates to 659 euthanasias in total per year at GBGB tracks (24 tracks), 590 for injuries. The total number of greyhounds euthanised for injuries will be higher as injuries go undetected at the track, pressure from tracks not to euthanise on site (affecting their statistics), injuries occur in training, resulting in euthanasia off the track. Guillard’s thesis describes all the injuries and their treatment. All these injuries are treatable, including the infamous hock injury, amputation is a last option, which does not significantly affect quality of life. Euthanasia should only be performed if injury is fatal, and there is no possible treatment, which is so rare, every fracture can be stabilised, pain control achieved. I did search for life threatening, fatal stress fractures in human sprinters, not surprisingly, there were zero. Greyhounds continue to be destroyed for treatable injuries, caused from racing, on economical grounds, putting profit over welfare. * 4.1(a) and (d) A person commits an offence if—(a)an act of his, or a failure of his to act, causes an animal to suffer, d)the suffering is unnecessary. “…ABOVE ALL, my constant endeavour will be to ensure the health and welfare of animals committed to my care." I doubt the track veterinary surgeons in their own surgeries, would advise euthanasia for a known treatable fracture without x-ray, for a pet greyhound. Why do their ethics and clinical practice then change regarding greyhounds at the tracks? 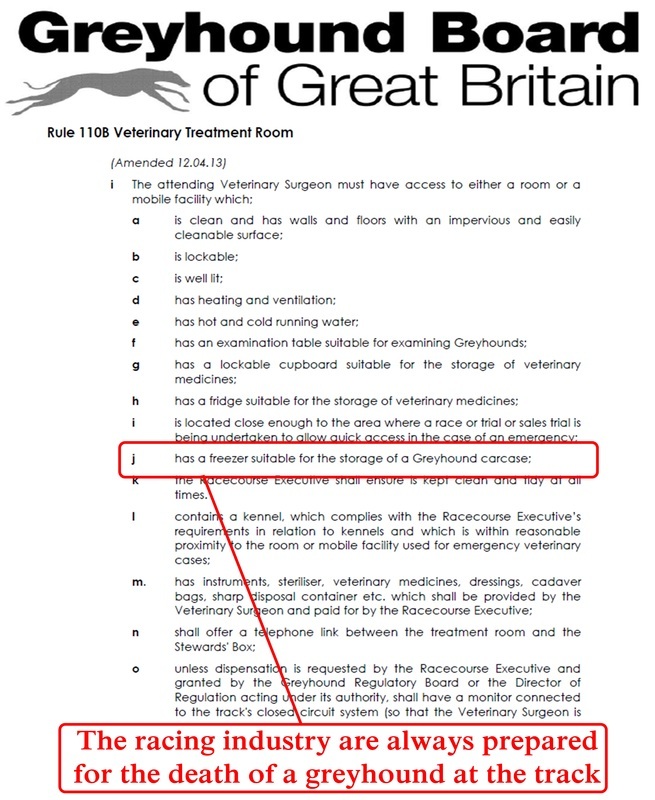 The track veterinary surgeons can stabilise the greyhounds and refer for treatment with the trainers’ own surgeons, or attempt to find the greyhound rescue placement. I also question whether they can adequately examine every greyhound in the time allowed before each race, especially if an injury occurs. Greyhound racing will never be safe for greyhounds Changing bend angle, starting trap position and increasing banking (increases speed associated with injuries) will decrease the impact load on the bends, but not to an acceptable level. The industry says racing is safe (the GBGB’s web page FAQ). I have demonstrated above that racing greyhounds on bends is not safe, will always be dangerous resulting in high injury rates and euthanasia. 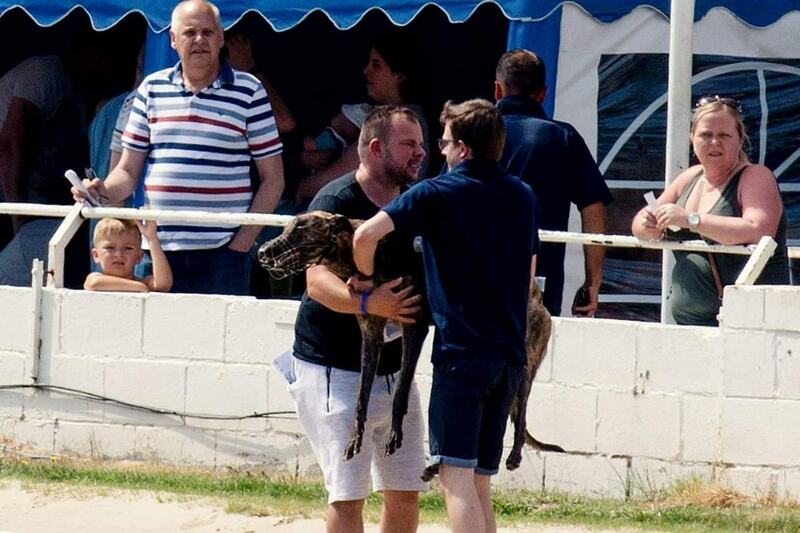 The industry says that greyhound welfare is a priority (GBGB web page, annual report). * Euthanasia an accepted part of greyhound racing, from injury or the inconvenience of rehoming. * Awarding a trainer awaiting a disciplinary for a positive cocaine urine sample. * Trainers under pressure to fill BAGS contracts, race greyhounds with injuries and inadequate healing periods. The information from the recent Australian inquiry in to greyhound racing revealed worrying practices and statistics. It would be naive to think the same practices are not going on here. When injuries are left by the Owner/Trainer this can create unnecessary pain and discomfort to the dog, we have come across a few cases where Owners/Trainers have not got their dogs medical help when its needed. The case below was a recent case from Feb 2014 - By Homes for unwanted Greyhounds. "The lovely girl Dawn has just arrived to us from her trainer after she broke her leg approximately one month ago. We were immediately concerned about the state of her leg as it has not healed at the correct angle and she cannot bear weight on it. After consultation with our vet, we will need to have her leg reset by a specialist so that it can begin to heal properly. The leg appears to have received little medical attention since the injury, causing it to heal at a strange angle, as can be seen in the photo. of age, she should make a lovely family companion once her leg has healed. and the care she will require during recovery."